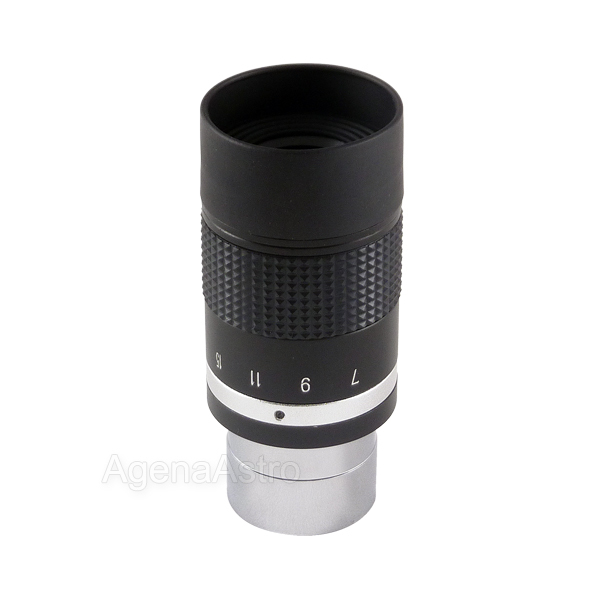 There are a number of things that you will thoroughly enjoy as an owner of this "StarGuider" 7-21mm 1.25” zoom eyepiece. You’ll enjoy the high quality par-focal range which allows an observer to easily transition from low to high powered viewing without changing eyepieces! The knurled rubber grip and non-click stop adjustment mechanism will ensure that the observer can smoothly find the best magnification and field of view that the target object and seeing conditions will allow. In addition, a 30 to 43 degree field of view range combined with very generous eye-relief and a foldable rubber eyeguard makes this eyepiece well suited for eyeglass wearers and non-eyeglass wearers alike! The eyepiece is threaded to accept standard 1.25" astronomy filters. Made with high quality multi-coated optics, this eyepiece will be providing high contrast views and unparalleled ease of use for years to come. It is what is says it is. It works well and does what it is made to do distortion free. receive my eyepiece promptly as estimateded.It come with as silver ring with a small setscrew straight to accurantle position the zoom value.You just need small screwdriver to adjust it.My eyepiece was a little off..
Saturday I viewed Saturn it was low in the sky @ 16 arc seconds small.I used my 6 inch f/15 mak cass.Saturn was low in the sky I could see the casssini division at its edge and some bands were seen the sharpness of the image was very good just a little below my favorite zoom the lit vix.That eyepiece cost more than 4 times more than this eyepiece.Whwn at low power 22 mm. the eyerelief is strong amount ,1/2inch and at 7 mm about a 1/4 of an inch from the rubber guard (This is for my vision I wear glasses) .Although it seems a bit long the eye relief.I like it and thught it comfortable to view.Also I thing it is a good fit for people who have to wear glasses when viewing through a telescope.They have astigmatism).another thing I viewed the m22 cluster and got all of the center in my view at medium powers stars were sharp,also al I zoomed the zooming was smooth and I the focusing at all point were parfocal).Nice.This does have a smaller field but it has more magnification and will challeng the limit of my my scope.This is an exelllent value for the money!! Does the job for those quick scans when the viewing window is short. Viewing angle is not very wide but I expected that, most zooms have the same issue. Optics quality are good, this is a keeper in my lens case for sure. Review by Sojourner of New Westminster, BC. I live where I don't have many clear nights to observe and even fewer when I have to get up early to work. I used this eyepiece earlier in the year when Jupiter was visible in the evening. I used it with my 4" F10 apo refractor. What ended up happening was this, it was the only eyepiece I used for the couple of hours I had in the evening (for 2 different nights). The 1st night I used it I forgot about changing it out for any of my single focal length eyepieces. I remember starting to pack up my gear when I realized I hadn't used any other eyepieces. One of the nights included a shadow transit of one of the moons of Jupiter which I watched without even barlowing up for higher magnification. From 24mm to about 16mm the fov is a little narrow but I can't complain about the quality of the image. The quality of the image is great thru the whole magnification range of the eyepiece. For a grab & go type 'scope this could be the only eyepiece you need to use if you're trying to limit the amount of equipment you're carrying. For birding this eyepiece would be great to be able to zoom in quickly without potentially losing the bird while changing to higher power eyepieces. You'd lose nothing to image quality from a single focal length eyepiece.